Having been part of two theater renovations which had enlarging restrooms as a major focus of construction I read CityLab’s article on the history of women’s restroom lounges with some interest. It may not seem like an engaging subject, but since expectations about amenities like restrooms have a significant influence in whether people enjoy their experience, it is something to which it is worth paying attention. Theaters were among the first buildings to include lounges as you might imagine, but I was surprised to learn that the lounges pre-dated indoor plumbing. There was a sense that the genders should have places to retire to separately even before other physical necessities were addressed. When public restrooms were first introduced, they weren’t segregated by gender because they were all single use rooms. It wasn’t until construction techniques enabled greater amount of indoor plumbing that these single use rooms were attached to gender segregated lounges. Of course as technology allowed for communal restrooms, those became even more firmly associated with separate lounges. Over time, the lounges began to be omitted from new construction, and with few exceptions, those building with lounges saw the spaces repurposed for other uses. The thing I am curious about is how restroom sizes shrunk to the point where we are now expanding them to accommodate need. Was there a time when architects decided people didn’t need as much restroom space as they do? Alternatively, have people become more comfortable using public restroom spaces placing more demand than was the norm when the spaces were originally constructed? Another explanation, at least for performing arts spaces, might be that the expectation that you be back in your seat promptly at the end of intermission has directed more people to restrooms in a shorter period of time than when the building was first constructed. I would be interested to hear what theories people have. Well, so much for AI. Long way to go, I guess. I have been reviewing subscriber questionnaires from some 30 organizations in 8 countries over the last 10 years or so. There is almost always complaints about toilets. First I thought it was funny curiosity. But of course if you get incontinence (is that the correct word in English) it is not nice to sit through a Mahler and then not have time enough to take care of more earthly needs. This week I read a survey from Sweden. 3 people complained about that the doors to the toilets tended to slam people in the corridor. 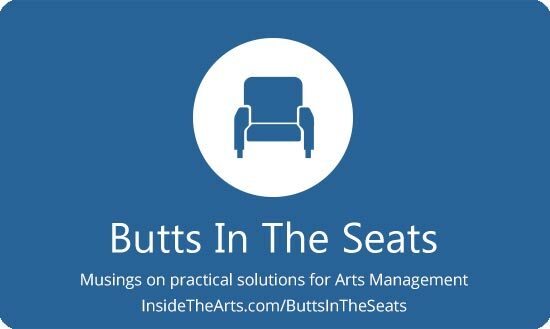 Couldn’t have imagined this was a topic when I joined the arts management movement. Right! I spent at least 5 minutes yesterday talking with staff about theories as to why the line at the women’s restroom started out shorter and moved faster Friday night than it did Thursday night. Granted, we also discussed why it took longer to scan tickets Friday than it did on Thursday too. In live experiences wait times for anything are important elements and bear some attention.